A couple of months ago, I wrote a blog simply reporting research on the need to reduce our consumption of meat significantly. The response from ToM commentators was sadly predictable in both tone and content. I was ‘obviously’ part of a vegan ‘tree hugging community’ (I’m not at all sure what’s wrong with hugging trees! ); ‘spouting rhetoric’ devoid of ‘reputable’ research data and of being sponsored by unnamed sources (possibly and mischievously, An Bord Bia – the Irish Food Board, no less!!). For the record, neither a vegan nor a vegetarian am I but, hands up, I do take the debate on the links between industrial food production (especially but not exclusively meat) seriously. For me, and for very many others worldwide, the research evidence of the need to significantly REDUCE our consumption (and waste) of meat is compelling. The debate on meat production, consumption and waste is a serious and urgent one despite the ridicule, snide remarks and vested interest resistance. It is paralleled by the debate on the role of fossil fuels and the powerful agendas involved. Like it or not, both issues will increase in importance in the years immediately ahead. The research and analysis on the issue has been summarised in that ‘reputable’ journal the Lancet (most recently in two studies in January 2019), by the World Health Organisation, the US Environmental Protection Agency, the UN Environment Programme; by research institutions such as the rural-focused Rise Foundation in Leuven, the Worldwatch Institute in Washington, the Heinrich Böll Stiftung in Berlin to name but a few. The research is also conducted by scores of universities worldwide, the list is almost endless and the details readily available for anyone genuinely interested in the debate. Hardly a disreputable mob! One: environmental. Livestock currently has the world’s largest land footprint and one that is growing fast. Almost 80% of the planet’s agricultural land is now used for grazing and animal feed production, despite the fact that meat delivers just 18% of our calories and 37% of protein. Increased meat consumption has more than doubled in the past fifty years with the result that demand for meat has increased five-fold. In turn, this has multiplied pressure on the availability of resources such as water, land, feed, fertilizer, fuel as well as waste disposal capacity. Crucially, the raising of livestock results in the emission of methane and nitrous oxide from excreted nitrogen, as well as from chemical fertilisers used to produce animal feed, especially for those packed into animal growing ‘warehouses’. This has serious implications for climate change. The UN Food and Agriculture Organisation estimates that global meat consumption will increase by some 65% in the next 40 years, a scenario that is simply not sustainable. Two: health. While per capita consumption of poultry has increased, the majority of meat consumed is still red meat and over one-quarter is processed meat. These are often high in saturated fat and cholesterol, as distinct from the more nutrient-dense beans, peas, lentils, soy products, nuts and seeds). 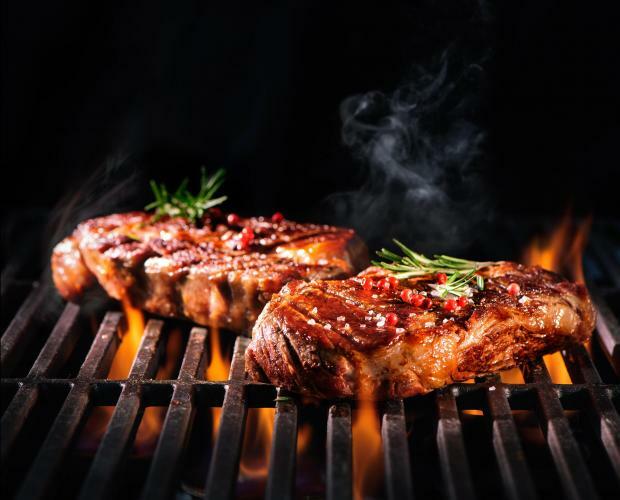 Strong scientific evidence now exists linking excess meat consumption (especially red and processed meat) with heart disease, stroke, type 2 diabetes, obesity and certain forms of cancer cancers. And this without factoring the many recent health ‘scares’ from meat products, the increased use of feed additives and antibiotics or the animal viruses as a result of intensive meat farming. Three: ethics. Animals raised in intensive farming operations are routinely subjected to overcrowding, confined conditions that severely restrict movement, enforced and painful body alteration (think chicken breasts), feed deprivation, early weaning, and other physical and emotional harms. Such practices induce stress which can increase animals’ transmission of disease, an issue for both human and animal health. And this without even approaching the controversial topic of ‘animal rights’. The challenges posed by the debate are by no means easy. This is illustrated by the tension (and potential conflict) between farmers, the agribusiness industry, giant food corporations, consumers and environmentalists. Livestock farmers often view themselves as an easy target for environmentalists arguing that they are singled out for attack. They accurately point to consumer behaviour in, for example, the transport sector. Private car use is not only tolerated, it is actively promoted despite the associated emissions. Similarly with air travel. Consumers continue to seek meat products at reduced cost ignoring its implications while food giants and supermarkets promote not just cheap meat but increased availability of cheap meat, again ignoring its consequences. In reality, in a world of climate change and severe environmental stress, the evidence suggests fewer meat focused meals, reduced meat portions, an end to meat waste and a move to more flexible and diverse diets with increased focus on fruits, vegetables, plants and pulses. The world simply cannot sustain a meat-saturated diet on the scale of industrialised countries. Change is on the agenda despite the widespread emotional resistance to it.